With the 2016 season over time to reflect on the racing and pick a handful of highlights. Paris-Roubaix comes first. It can be an easy pick because of extremism and eccentricy, it stands out because it’s so unlike anything else but this year’s race was gripping from start to finish and it was all live on TV too. The race celebrates the mining landscapes and ancient roads but begins with a touch of bourgeois conceit in Compiègne amid the elegant Haussmanian architecture. It’s fleeting and as soon as the race leaves the town the landscape opens up and, depending on how generous you feel, could be described somewhere between exposed and bleak. The wind was up teasing the peloton to break into echelons. The attacks were flying and it was all live on TV. The moves were not the usual wildcard bids for airtime but contained big names from big teams, the kind of moves that either send lieutenants up the road as longshot bids for victory or merely to act as a lure to force others to chase. Strong riders like Sylvain Chavanel, Mathew Hayman, Imanol Erviti and Salvatore Puccio were away. 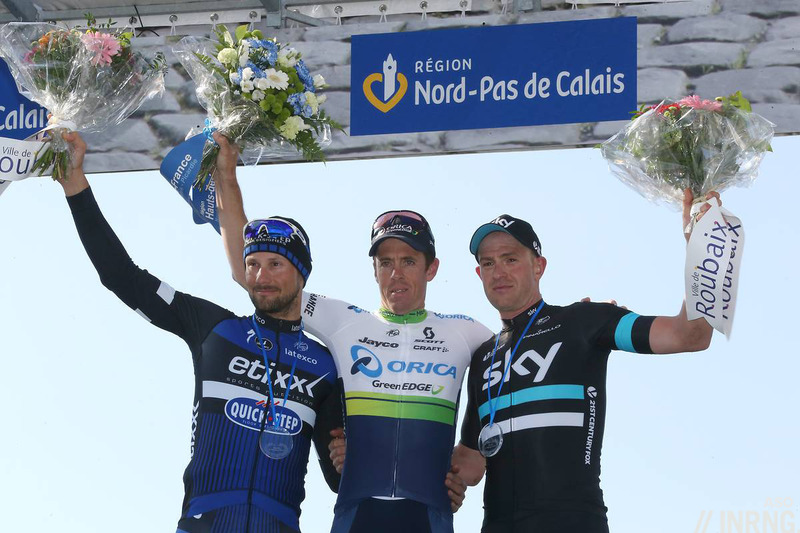 Etixx-Quickstep weren’t and were forced to chase, a springtime theme for them. Team Sky joined them, a squad still hunting for that first Monument classic despite spending on all those millions. In time a big crash blocked the peloton and suddenly race picks Peter Sagan and Fabian Cancellara were caught on the wrong side, bad but the ruin came from a lack team support. Sagan’s lack of team support has been obvious for years – 2017 isn’t going to solve this either – while Trek-Segafredo’s problems were less structural and more sudden after crashes took out valuable helpers before they could get to work. Etixx and Sky continued their chase but it was now as much about containing the move ahead as it was distancing the riders behind and Lotto-Jumbo joined in. The final survivors of the morning’s breakaway were finally caught before the Orchies pavé with around 70km to go and Tom Boonen decided to provoke a selection over the cobbles. Behind Fabian Cancellara was in full pursuit mode and it made for several simultaneous contests, Boonen and Co. at the front, the chase group behind and further back Cancellara in full flight. With 20km to go Sky’s Ian Stannard accelerated on the Camphin cobbles and the lead group was down to Stannard, Boonen, Edvald Boasson Hagen, Sep Vanmarcke and early breakaway survivor Hayman still there. Surely it was a matter of time until Hayman got dropped? With hindsight you may think “no, he stuck with them” but actually he was ejected following a savage attack by Sep Vanmarcke, ankles flailing like nobody else, on the Carrefour de l’Arbre. However Boonen did the work to bring Vanmarcke back and Hayman clawed his way back. The excitement continued as the lead five traded more attacks in the final kilometres including a strong move by Boonen. Of the quintet Hayman seemed the least likely to win. Boonen and Boasson Hagen have both won bunch sprints, Vanmarcke’s beaten Boonen in a sprint and Stannard’s got ham shanks for legs and a track background too. Hayman? Well it’d be grand if he made the podium, no? 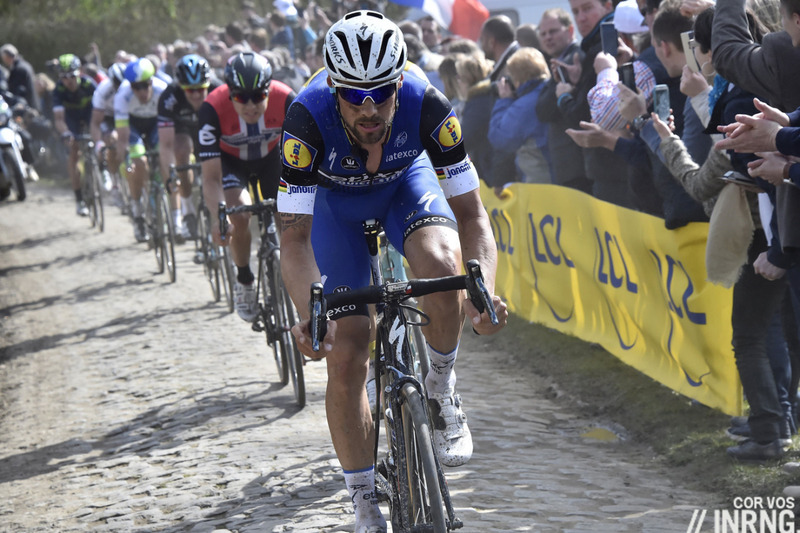 In the moment all eyes were on Boonen and his bid to become Mr Paris-Roubaix and silence Roger De Vlaeminck’s taunts once and for all. Hayman led out the sprint and nobody came past. For a moment it felt flat, the lesser rider triumphing. Harsh? Perhaps but Hayman himself was just as stunned. It was all live on TV. In isolation this alone is a highlight, an entire classic in HD is a great thing, or rather having the option to watch it all is good. Had the race turned out differently with a break of no-hopers not taking much time then it could have been five hours of boredom but this first attempt was great because it offered action and suspense for the best part of six hours. Each claim in the Roubaix velodrome like “if I’d only I’d sat tight on that earlier section” or “I should have used that corner on the road before Arenberg to move up a few places” isn’t just the coulda, woulda, shoulda of a loser but the sound of lessons being learned, human capital banked for next year’s race. It helps explain why Paris-Roubaix is country for old men, winners are regularly in their thirties. 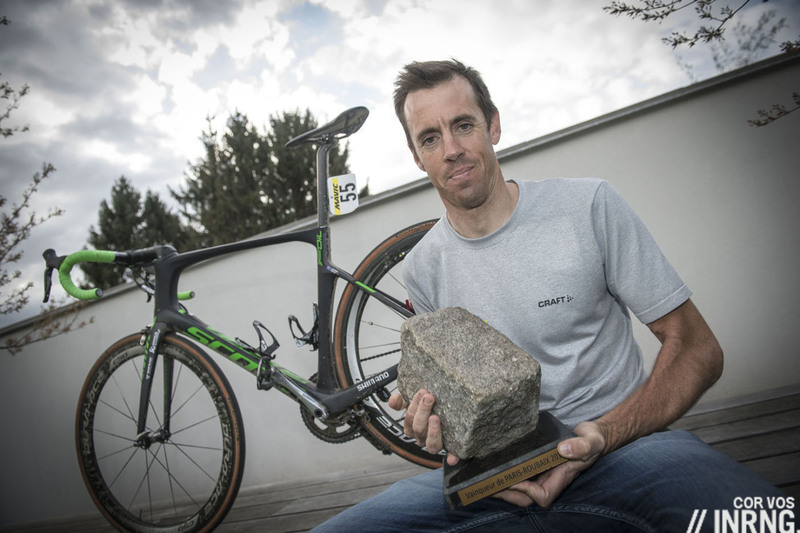 Mathew Hayman has spent 18 years as a pro and finished Paris-Roubaix 15 times with two top-10 performances before winning this year. None of this made Hayman’s win inevitable, far from it, but it helped him be in the right place at the right time again and again on the day. Similarly this experience and affinity for the race explains why most of his spring campaign was spent… in the garage doing Zwift sessions after breaking his wrist in Het Nieuwsblad, he wanted to be back just for this race. Replay the race over and over again in a sporting Monte Carlo simulator and surely Boonen and Vanmarcke would win more often. But they lost this year. There’s also the small satisfaction of a Hayman’s win on a standard team-issue bike, not for him the legion of “Roubaix” branding. One rider who could go back but won’t is Fabian Cancellara. His spring campaign wasn’t the fairy tale ending, a win in the Strade Bianche and then second in the Ronde and reduced to chasing his way to Roubaix before a pride-wounding crash on the velodrome banking. The Giro didn’t work out and nor did the Tour but perhaps this was just training for his Olympic gold in Rio. Cancellara’s retired now while Boonen’s proximity to the win encouraged him to ride on for a year and Hayman will be back too. Why the highlight? A vintage edition of a classic race. The result was a surprise and uncertain right until the final metres, the final act of a long day’s sport that began with the early attacks. Ham shanks for legs! Brilliant. And a brilliant race. Definitely the one that stands out to me. Despite the fact I was hoping Boonen would be the atop the podium P-R WAS certainly a highlight of the season with a worthy winner, made all the better by “Hayman’s win on a standard team-issue bike, not for him the legion of “Roubaix” branding.” demonstrating that the wheels and tires play far more a role here equipment-wise than all the fancy shock absorbing gizmo-mobiles the marketing-mavens would like us to buy. Maybe I’ll get my wish with a “Tornado Tom” win in 2017? My heart wanted Boonen to win. A thoroughly satisfying race. Watched the whole thing on TV. My wife thinks I am nuts. No change there then . . . .
A superb edition, the best one day race I’ve seen. The final five had everything: an all-time great, a future champ (? ), unfulfilled potential, solid journeyman in the twilight of his career, and a UK rider (I realise that doesn’t matter to everyone). Boonen’s reaction to Hayman’s win was brilliant too, so gracious, what a guy. A classic Classic and a monumental Monument. It topped off a tremendous Spring actually. I loved that race. So much action for such a long time. I was rooting for Sep but there just weren’t enough cobbles for him. Hayman as the underdog, both in palmares and because he was in the break, was a great winner too. Such a highlight. I remember putting on the start thinking I’ll watch for a bit then go out. Six hours later I was still there. I think I thought each of the final 5 were going to win at some point in that final 30 mins or so. Would have loved Stannard to get it as a Brit but just happy with a great race. Definitely a good-un. This highlight race was run in relatively benign conditions once again, too. Despite dire predictions in the days before, the riders faced just the odd drying puddle. It was enough to wipe out Sky though, who, for all their power, continued to show something of an intellectual deficit when racing these Classics by riding in formation just as they do in the GTs. After Martin’s massive 40k venture earlier in the race, Boonen (as always) looked good -until he couldn’t get up the banking to launch the last sprint. But more than the race as a whole I shall ever remember the moment of Sagan’s skills and his double bunny-hopping to stay upright but out of sight in the finale. Talking of Tony Martin and 20/20 hindsight, what was the overall opinion on his ‘conversion’ to the cobbles this Spring? It was unfortunate that in many races, as Inrng has pointed out, Etixx were off the pace and missed moves. I guess part of this was down to Martin, although other riders consistently messed up too? But the poor Spring that Etixx endured seemed to start the rot in Martin’s relationship with Etixx, that terminated in their eventual parting of the ways. Yeah, it never really happened for him in terms of the Classics, did it? My abiding memory is of him doing a massive pull on the front at Flanders about 75km from the finish or something. Ettix obviously didn’t fancy him there. He was very powerful but never decisive, it seemed he was used before the final phase of the race in part because EQS had missed the move and so needed him to pull back the break as opposed to forcing a selection. Apparently the team were very pleased with him because of more than his power, he had the ability to be in the right place and rode well on the cobbles as a relative novice in these events. I never did fully understand Etixx’ strategy at many of the Spring races last season, or Martin’s role. They possibly avoided doing early work and letting others sit on, but then repeatedly got mugged and ended up missing moves. I can certainly recall, amongst others, Trentin, Maes and Lampaert unsuccesfully straining to go with moves. It then seemed as if Martin’s power was often used in a firefighting capacity. But what was his role meant to be? Taken in the context of a very inconsistent Spring (for Etixx, that is), I ended up feeling largely under-whelmed with Martin’s contribution. It didn’t seem as if Etixx used him very well. I don’t know if that is fair or not? Also I think in the end the parting was more amicable than may have been suggested by the obvious falling out during the Tour. Martin was a solid part of the TTT worlds victory and he was thanked for his years of service for the team by all and sundry wearing a Etixxx or QS logo on his polo-shirt. It did seem very sincere. By the way it has also been suggested (by Lefevre I think) that Martin himself made some poor judgements / negotiations regarding his team & contract for next year and in the end was quite lucky to get picked up by Katusha. More on topic. Lefevere ought to fire Wilfried Peeters, he’s a dunce, no tactical insight and very limited authority. He was actually degraded during the Tour. He was recon man, not DS. Why not put Bramati behind the wheel in the Flanders classics as well? Or get someone new in the team? +1. WP is a classic example of an ex rider who’d struggle to get a job anywhere outside a cycling team. Lefevere being graceless about a rider who’s leaving his team? Shocked, I tell ya. Shocked. Completely out of character. 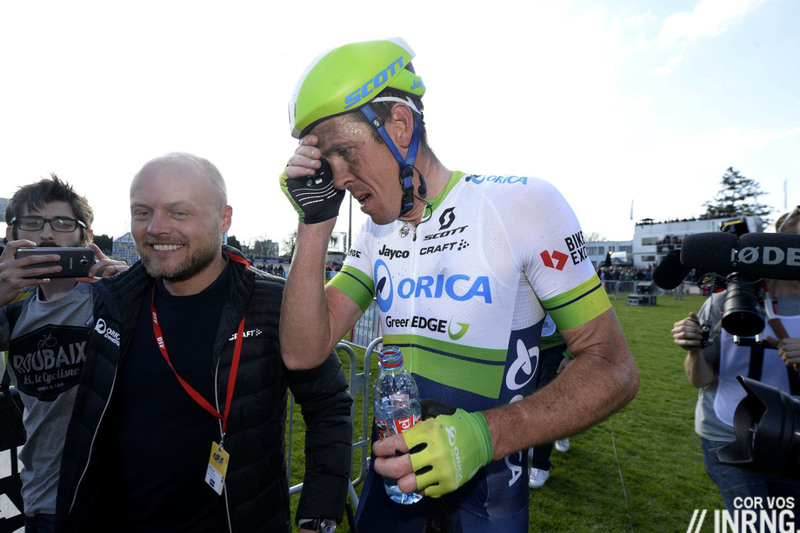 for anyone who missed it I’d really recommend Mitch Docker’s double headed podcast with Matt Hayman – one before (when they had no idea what would unfold obviously) and one afterwards (once Docker’s face had healed up from his more intimate ‘conversation’ with the cobbles in Arenberg). ‘Life in the Peleton’ I think it’s called. The “Backstage Pass” for PR is pretty emotional as well. Was very pleased for Hayman, despite being a bit gutted for Boonen (still think his positioning didn’t lose it, as some think: just watched the finale again – well worth seeing on OGE’s ‘backstage pass’ – and Boonen just didn’t seem to have the legs). Fantastic race with the absolute highlight for me being Sagan somehow staying upright after going over Cancellara at what must been a good 40 or so kph. As you say, Sagan would be far better off forgoing a few millions and joining a stronger team. Imagine how much more he might win with a team like Trek or EQS behind him – and I’m sure he’d still make a reasonable buck. True, but if we’re accounting, then Sky have 1 to Orica’s 4. So they’re still somewhat behind in the cash to monuments equation. I imagine they’ll take 4 TdFs as a fair return on their investment. But I get your general point. In terms of “bang for buck”, it would be an interesting game to see who gets the best “return” on their dollar spend (whether judged on media / WT points / other). Perhaps it’s Movistar? Perhaps OBE? I’ll leave it to @INRNG to perhaps do an in depth analysis. It could lead to some surprising results I suspect! Exactly. I mean take this season: Dimension Data recorded 34 wins with 8 at World Tour level, but OBE took 31 wins, yet 17 of them were WT. EQS had 56 wins, but a lot of them were at very minor provincial races, so we could measure them more by their 18 WT victories. There is a lot of debate at the moment about whether calling something “World Tour” has any meaning or if it does whether that is being diluted next year with the expansion, but if WT wins per Euro spent is your marker, then OBE come out on top. If the only that matters is the TDF, then it’s obviously Sky and DD who are the winners. Which was a minor highlight but still a highlight. Absolutely the highlight, here in Canberra (Hayman’s home town) there were quite a few people shouting at the TV with excitement at 1.30 am. And last weekend he won the Australian cyclist of the year award. Personally I went crazy in the last Km of LBL. I can only imagine what the last 20k of P-R must have been like for you Aussies. Fabulous race and what a finish!! Hayman has served his apprenticeship well and truly in this race and his deserved win was so good to see. Totally enthralling viewing. This may be the greatest sarcastic comment ever, and yet its true nonetheless. I was there for the race and really enjoyed my weekend. A real treat to be there this year. A fine win by Hayman amongst salubrious competition. Can’t wait for the next edition. EQS always bring too many big guns to the classics. Too many galacticos leaves everyone unsure of who to ride for. I think they would enjoy greater success if they had a better domestique:star rider ratio. As an Australian, this is the greatest race I’ve watched. Brings a tear to the eye every time I read about it or see a highlights package. A truly exciting race, even before the great finale, with Spartacus crashing out spectacularly on the wet cobbles. At the start, sentimentally, Spartacus was the favorite because it was his last Paris-Roubaix. Then at the velodrome, Boonen was the man to root for, with the chance to recall his past winning ways, and get the record for most P-R wins. So when Hayman crossed the line first, it was a bit of a let down. Immediately, however, after learning about his long career as a self sacrificing domestique, and his long personal hours of training in his garage on a trainer, the emotional tide turned in his favor, and he is a truly deserving champion. He seems to be a downright good bloke too! Let’s hope for more Hayman victories in 2017. “begins with a touch of bourgeois conceit in Compiègne”…ha, nice! Fantastic edition, that last 5 km was superb – no ‘clingers on’ every single one of them was attacking, counter attacking, clawing back ground…its wonderful when you see pro’s in the situation and every man going for it – it was the perfect selection of teams and people. And the race was ‘on’ for such a long time, you just couldn’t leave the TV from 120 km to go! Easily the best race of 2016, and possibly my highlight for the last few years. Certainly one of the best one-dayers I’ve ever seen. If a friend wanted to get into cycling I would tell them to watch this race. But I’m pretty sure they would stop following cycling after a few months as nothing will come close to the excitement of watching this race. Loved it. 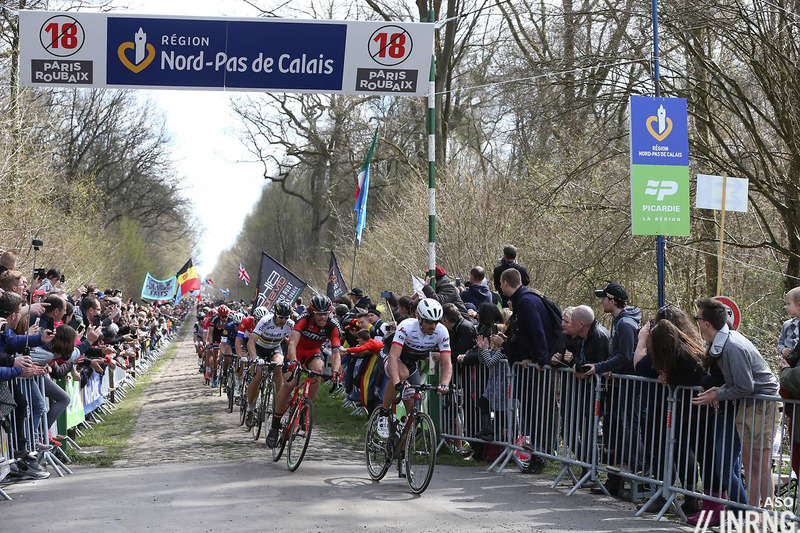 Ill be there watching next year and I hope that in my cycling fantasy world Brad Wiggins makes Roubaix his last race!! Dream on….. but It will be good to see Boonen in whats probably his last shot at the race? In my cycling fantasy world athletes wouldn’t abuse the TUE system to gain an unfair advantage. Time he slipped off stage left. “Boonen with 107 professional wins, Hayman with 2. But sometimes the underdog gets up”. An inspirational result for the battlers! Did you see the footage of the in-commentary-box camera, with Matt Keenan and Robbie McEwan trying to stay professional while massively excited and not quite able to believe it? I’d post a link if I could find it again, it’s a fun addendum to the Backstage Pass and Mitch Docker podcast (which was brilliant – having the unknowing ‘before’ chat is lovely). 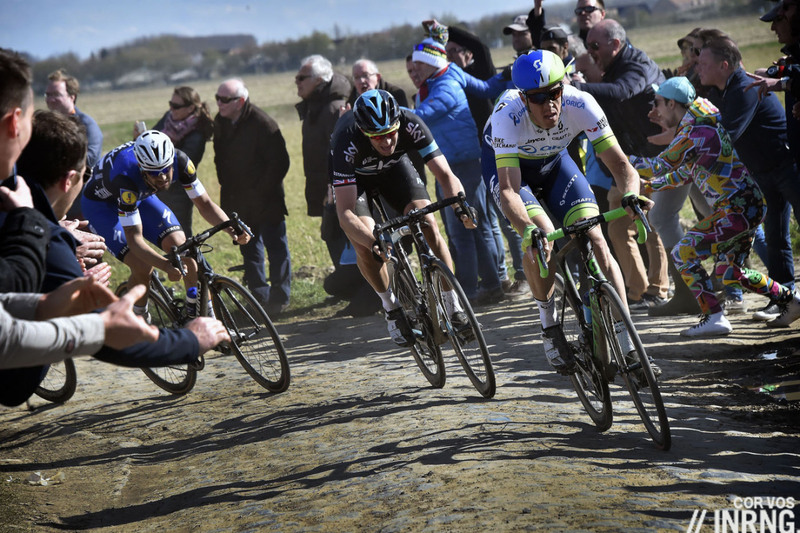 I am thinking of photographing Paris-Roubaix this coming year, does anyone have any suggestions as to the best places to get good photos as it’s a long parcours? Depends what you are going for. It’s definitely possible to do more than site and move to your next shot. The main spark points are the Arenberg Forest: that happens sufficiently early that you can make another spot. The Carrefour de L’Arbre is probably a little too late in the race for you to get back to the stadium in time, but is another key spot. You also have to remember that the stadium is likely to be packed early so trying to get a good position will be quite difficult if you are turning up late. The splits in the pack tend to get quite big towards the end of the race so you might still get shots of trailing riders. If you have a moped or motorbike you’ll get around far easier.